My name is Philodendron Selloum or Philodendron Hope and I am an easy to care-for floor plant. My dark green, shiny leaves are large and with deep lobes. I am native to South America but I was grown in Florida and am so happy to be going to my new home. Here are some care instructions and tips that will be useful as I get acclimated to my new home and grow with you for many years to come. I will be happiest indoors where I can get bright, indirect light such as near a south or north-facing window. Make sure that I receive bright light daily but that rays of sunlight do not hit my leaves. I tend to grow in the direction that I am receiving light. You can rotate my container every 2 or 3 days to make sure that I am getting even light and my stem doesn’t start to slant. Start by watering me once per week. Use a spray bottle, watering can, or measuring cup to water me with approximately 12 ounces (354 ml) of water per session. of water per session. Check up on the same day each week by inserting your finger into the soil about half an inch and feel the moisture level. If it feels moist, try again in a couple of days. If the soil feels dry, you need to water me as instructed above. I like moist but not soggy soil. Once we do this for a few weeks, you will get the hang of it and you can determine the best watering schedule for your light, temperature and moisture conditions. How tall will this plant grow? Philodendron Selloum takes up a lot of space, it could grow to a canopy of 5 foot wide or more with 2ft.-3ft. leaves. A Selloum does grow a trunk as it matures, but the huge drooping leaves usually hide it. Is it safe for my pets to be around this plant? 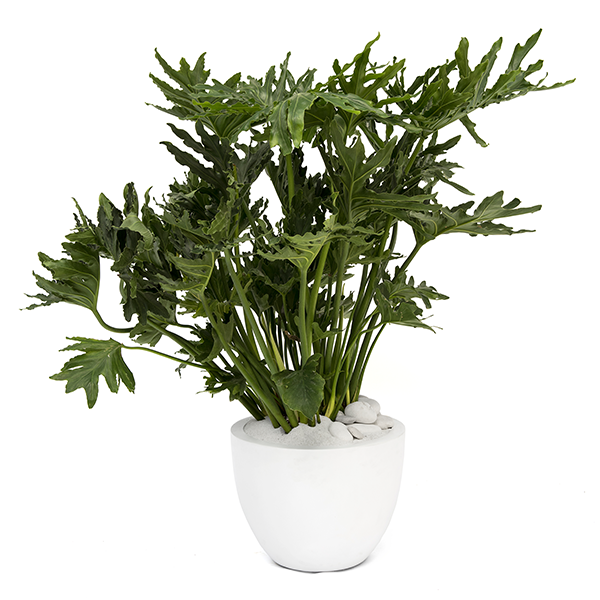 Philodendron Selloum is a very poisonous houseplant with a level #3 toxicity. It is not recommended to have pets around this plant. If you want to control my size or shape, use pruners or scissors with a sharp, clean blade. You can remove entire leaves be cutting them off at the base of the leaf stem. You can remove the lower leaves if you want to reveal the plant’s stem. Wear gloves and wash your hands and tools when finished, you don’t want to get the sap in your eyes or mouth. What do I do if I see small dark green blotches on the leaves? The leaves may be sick and eventually rot and die. The best way to prevent this sickness is to keep the leaves dry at all times, avoid overhead watering, and immediately remove any infected leaves. Why are the leaves turning brown and curling at the tips? I may have too much salt in the soil, usually from too much plant food or from using water that has passed through a water softener. You can make sure to dilute your plant food to 1/2 the recommended strength and never use water for any houseplants that has passed through a water softener. Drench the soil with some distilled water and feed less often. Why are the leaves turning pale green? The plant needs more fertilizer or if the plant is getting too much bright light. You can try moving to an area where rays of sun will not hit the leaves directly. The leaves tend to face towards the ray of light , so good idea to rotate the plant on a regular basis.